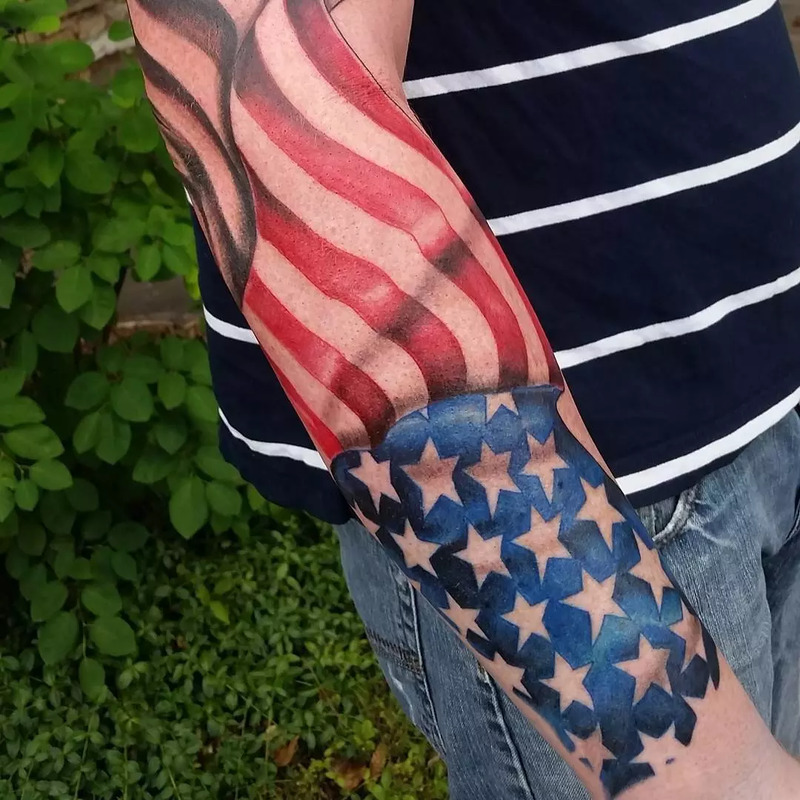 For Americans, vibrant American flag tattoos are a perfect way of showing just how red, white and blue you are. 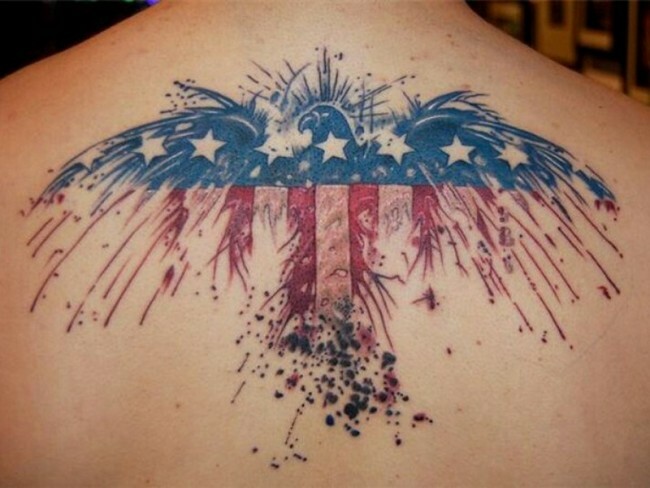 This is a great way of identifying yourself with your home country, or even with the one you simply admire. 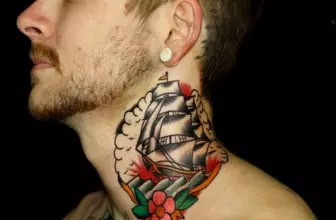 No surprise, since tattoos have always been in existence for identification purposes. 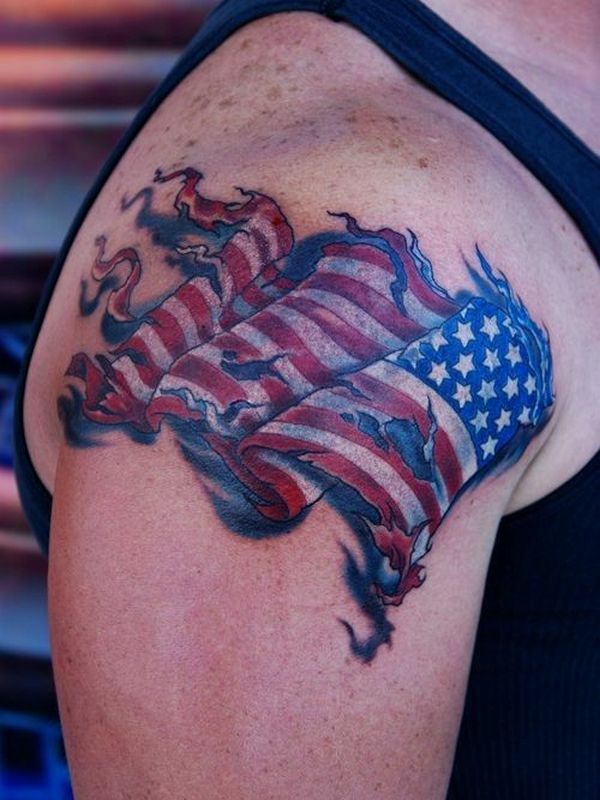 The flag of the United States of America has become one of the most recognized flags all over the world. 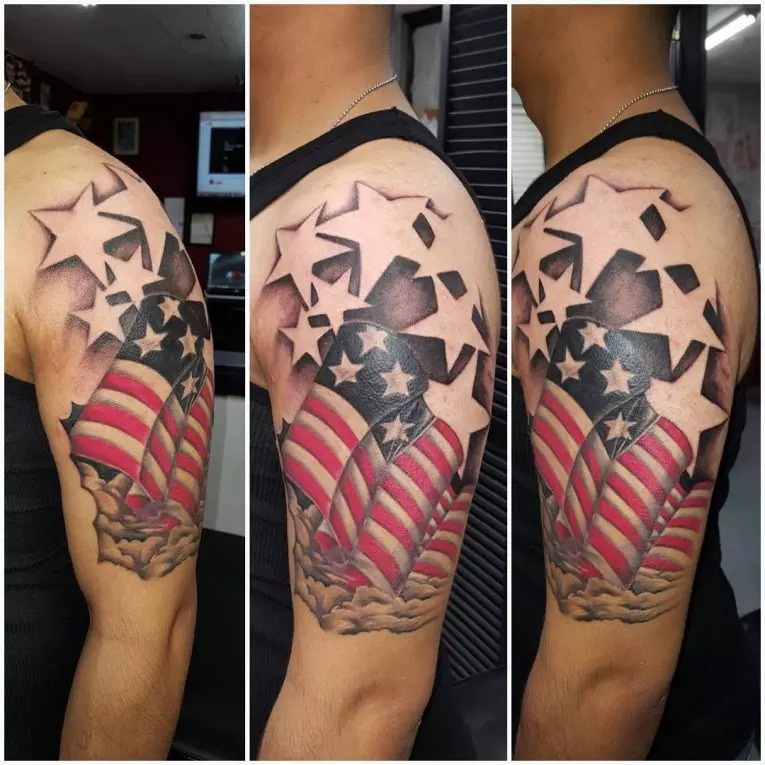 Its identifying factors are the red and white stripes alternating horizontally and a blue rectangle with fifty, five-pointed stars. 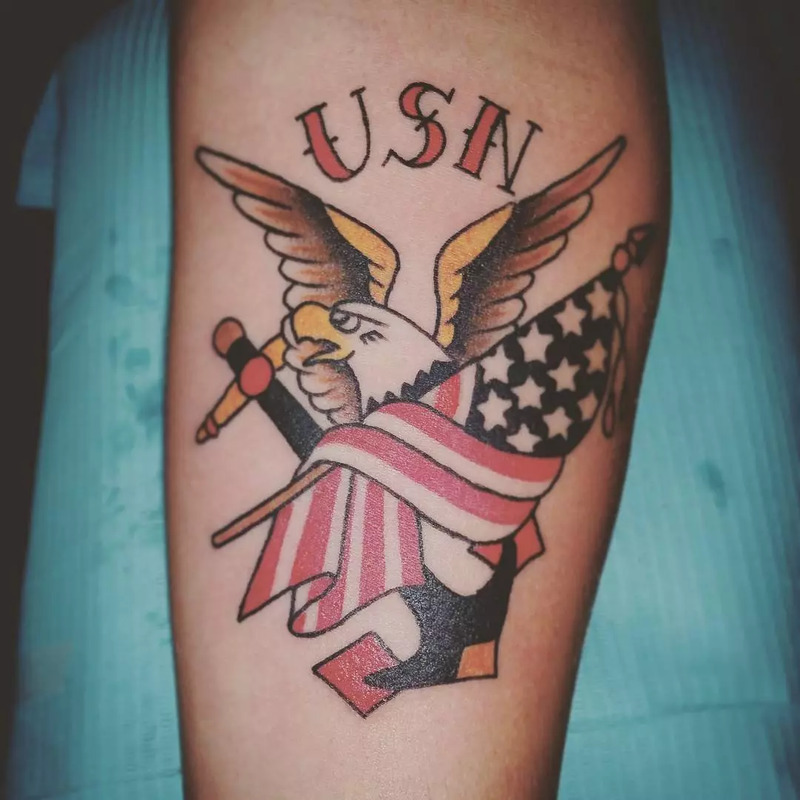 It is difficult, though, to get all these details accurately in a tattoo, especially when it’s small, but it’s easy to recognize even when you miss a few stripes or stars. 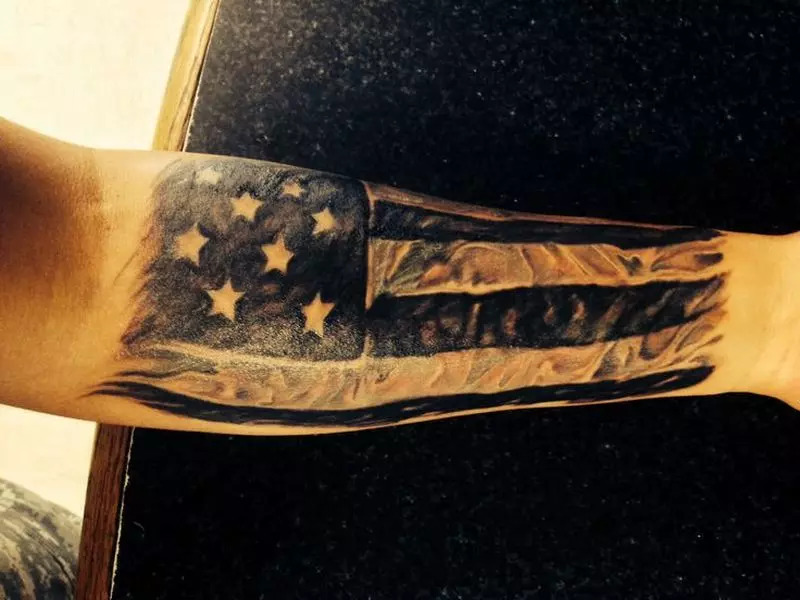 The main reason why someone would have the banner of their country tattooed to their body is patriotism. 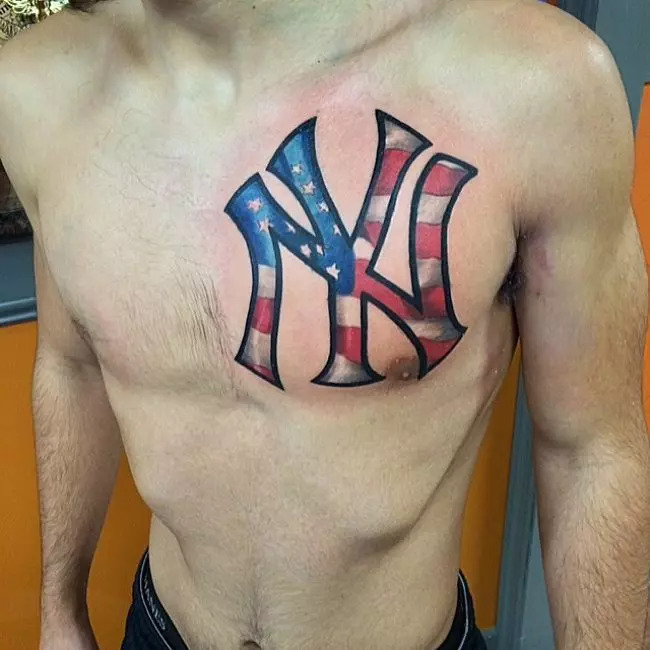 To show their love for their country and appreciation. 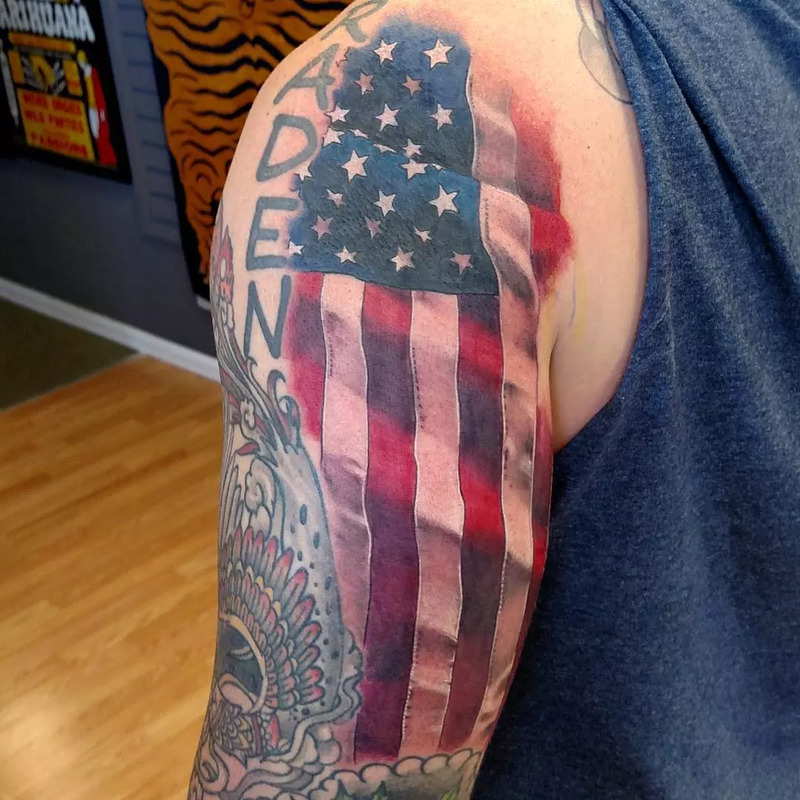 There’s something special, however, about the American flag; being one of the most powerful nations in the world and a champion for human rights the world over. 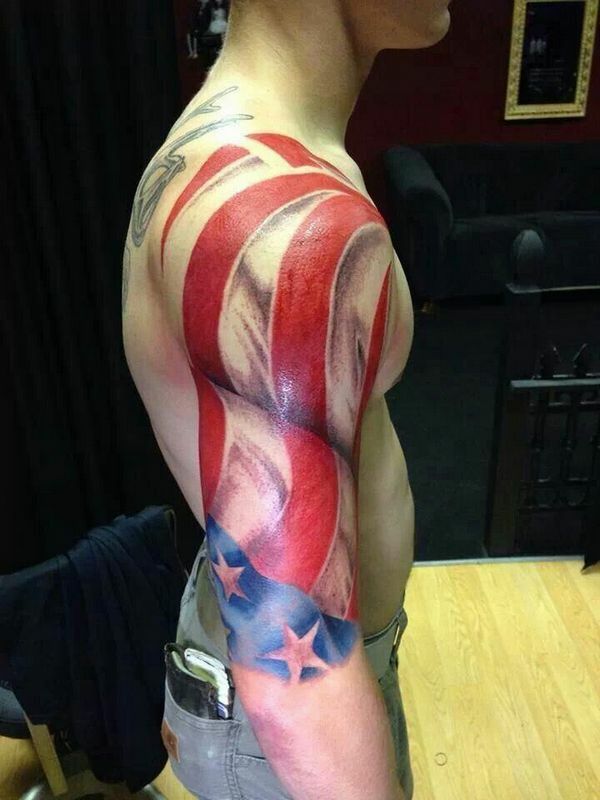 This has made America the most popular country and as such, the tattoos of the American flag are just as plentiful. 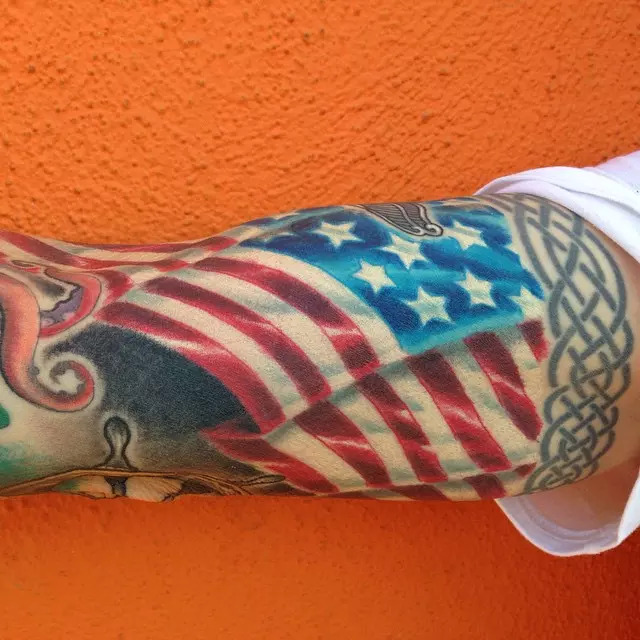 It’s not just for show and pomp, though, there is meaning behind each of these tattoos, and you had better find the one that reflects your own beliefs. 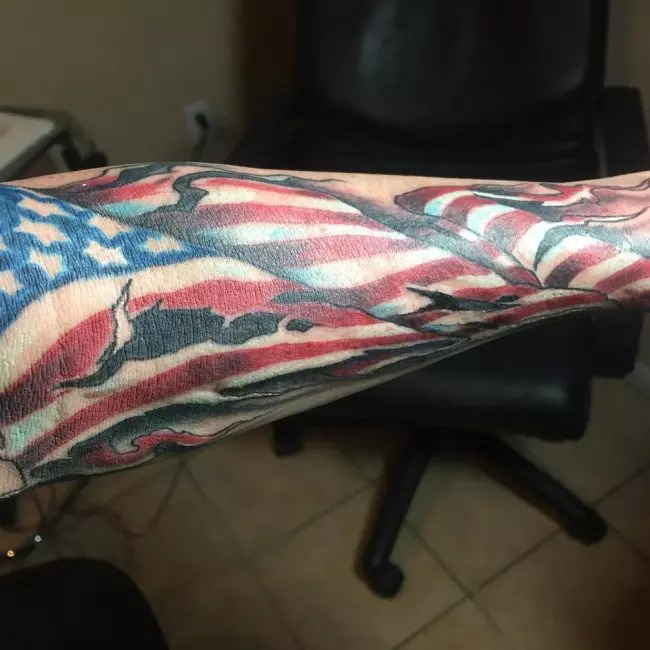 Any tattoo depicting the American flag has the purpose of showing the strength of the American people and their principles. 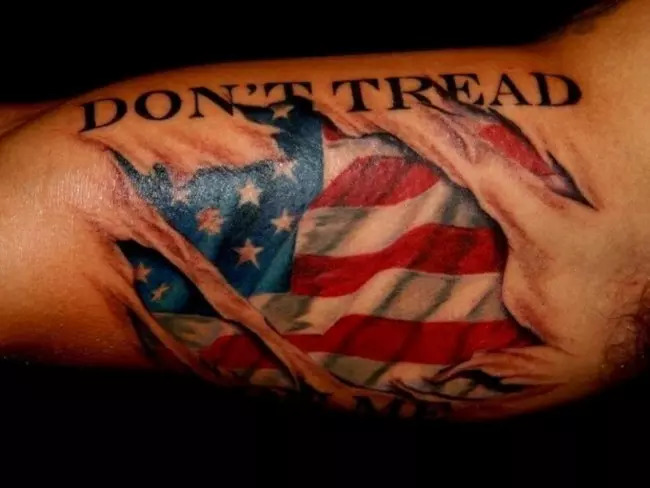 The banner, in turn, when worn as a tattoo shows just that, that you stand by the values held by the American people and you are ready to defend them. 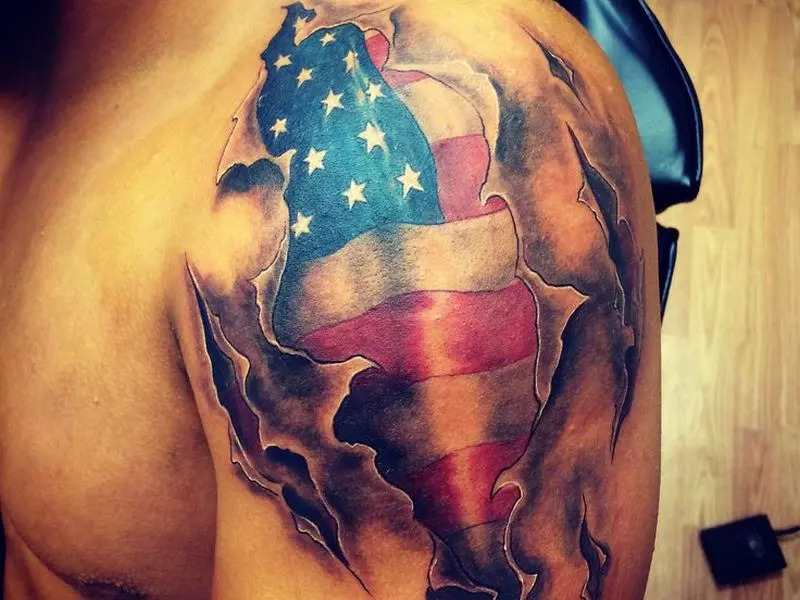 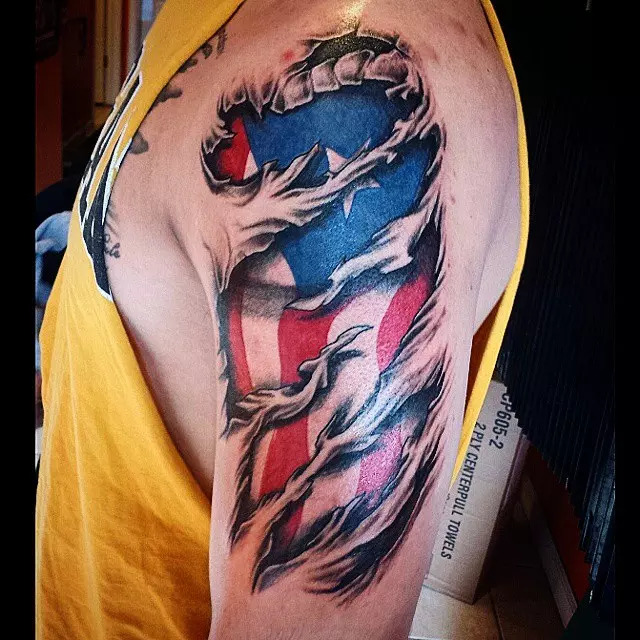 Inasmuch as American flag tattoos show patriotism, you can’t always just wear a banner tattoo only, otherwise there wouldn’t be any variations. 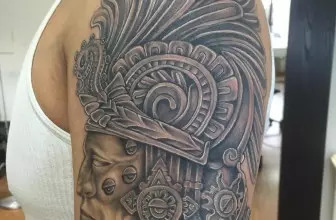 Unlike other traditional tattoos like the Japanese tattoos, which follow certain guidelines, banner tattoos can be modified in size, design and style. 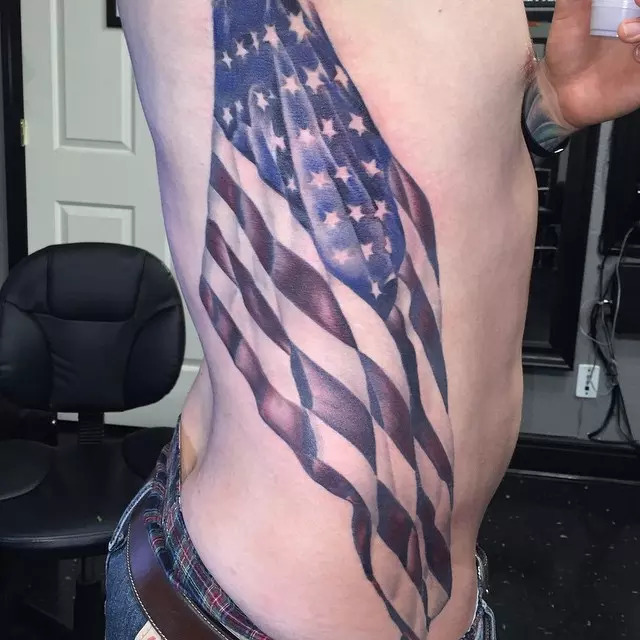 Furthermore, you can combine the flag with something else you value; something in line with American principles and beliefs. 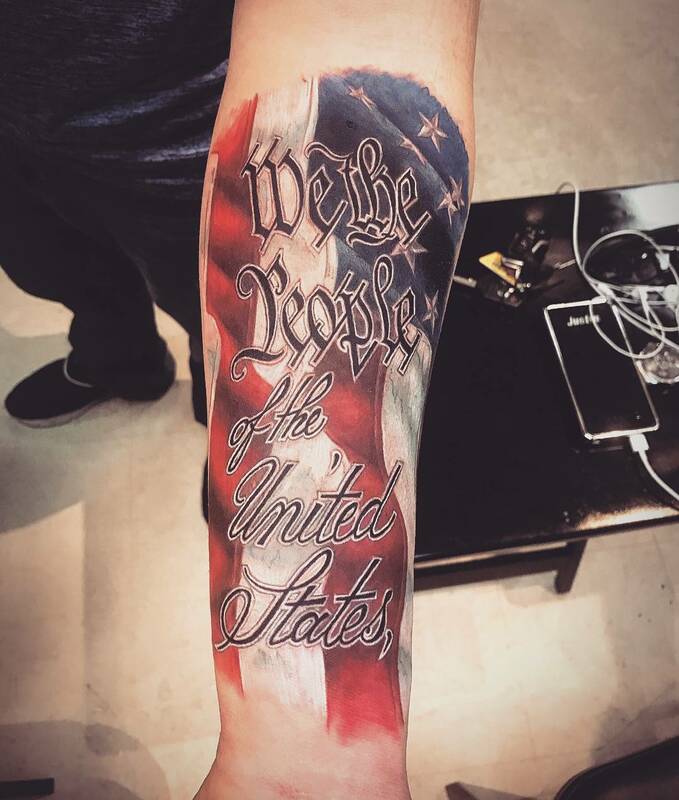 Take, for example, the bald eagle, the national bird for the entire United States, or the army. 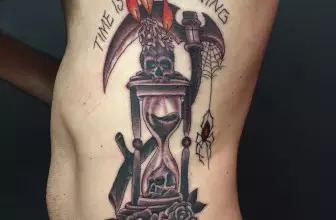 These tattoos are so versatile and there are hardly any fixed designs. 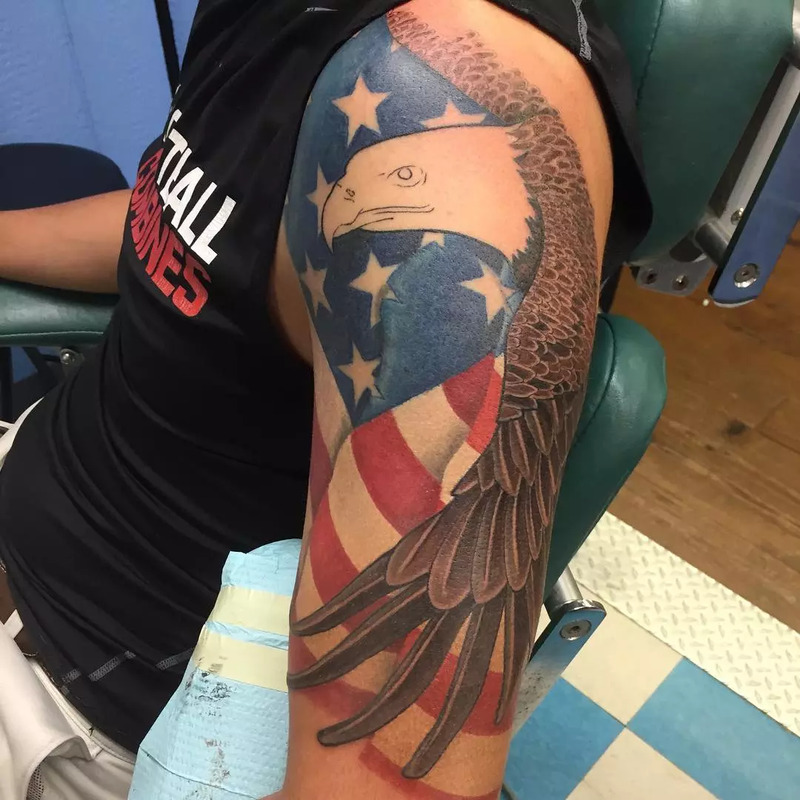 However, if you need some guidelines to help you think of something you might like, here are a few designs you may like. 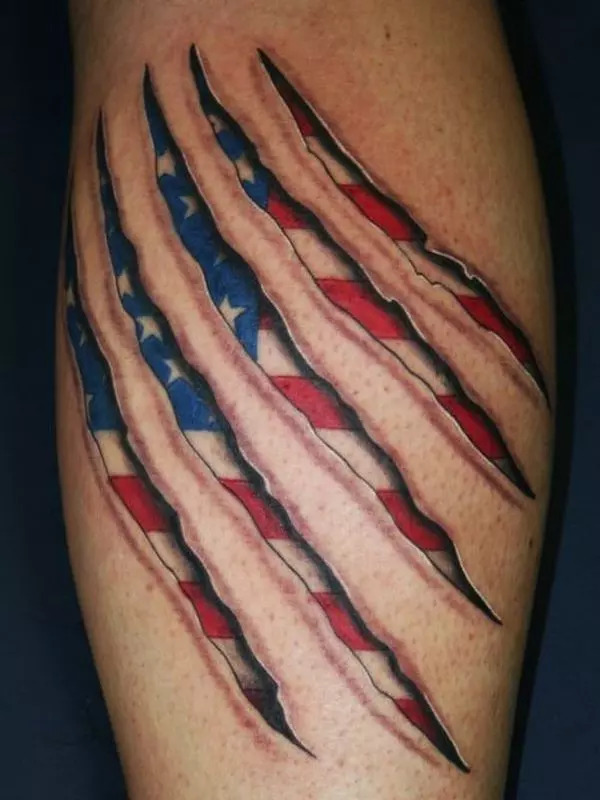 This is by far the simplest design of any American flag tattoo. 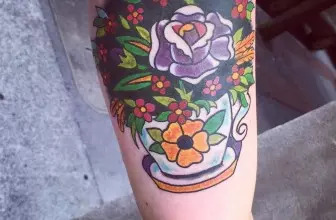 You get to choose where you want it and how large you would like it to be. 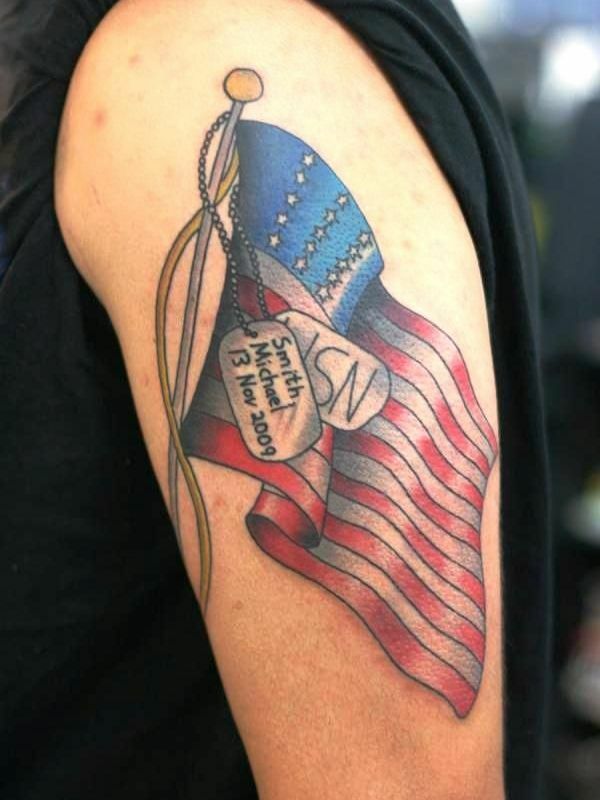 You can’t really change the actual design of the banner, unless you want to send a different message other than patriotism, but there are some variations. 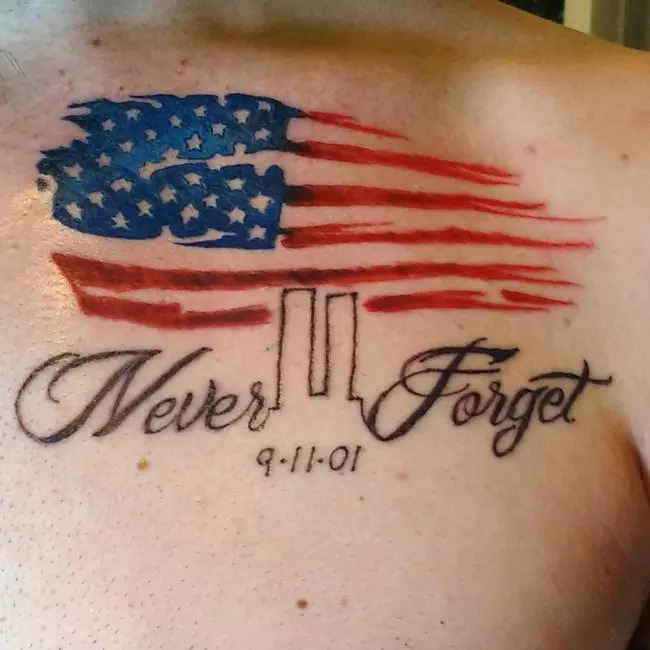 I have always admired minimalist designs and thereby like just the outline of the flag, all you really need are the stripes and stars to send the message. 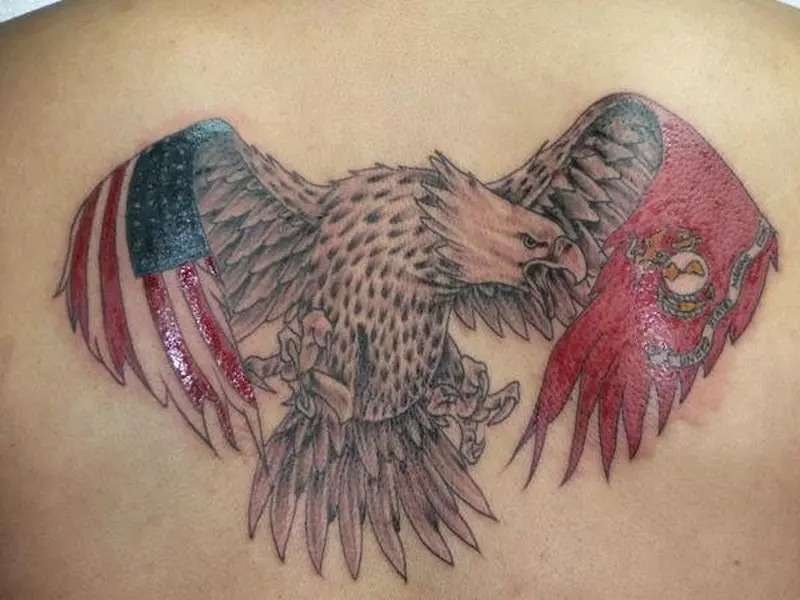 A more colorful design would be to have the whole banner drawn vividly, in full color and then perhaps making it flutter in the wind for a dramatic effect. 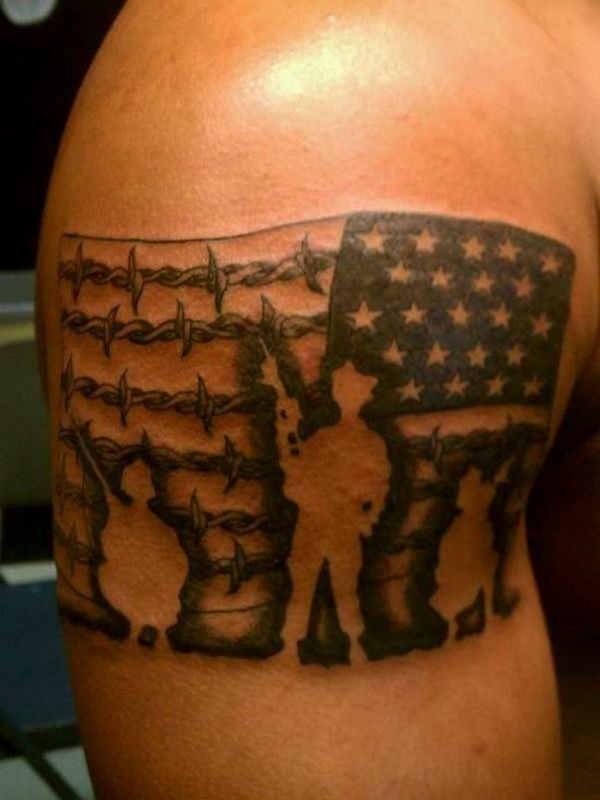 Whatever variation you go for, it clearly sends the simple message, that you love your country. 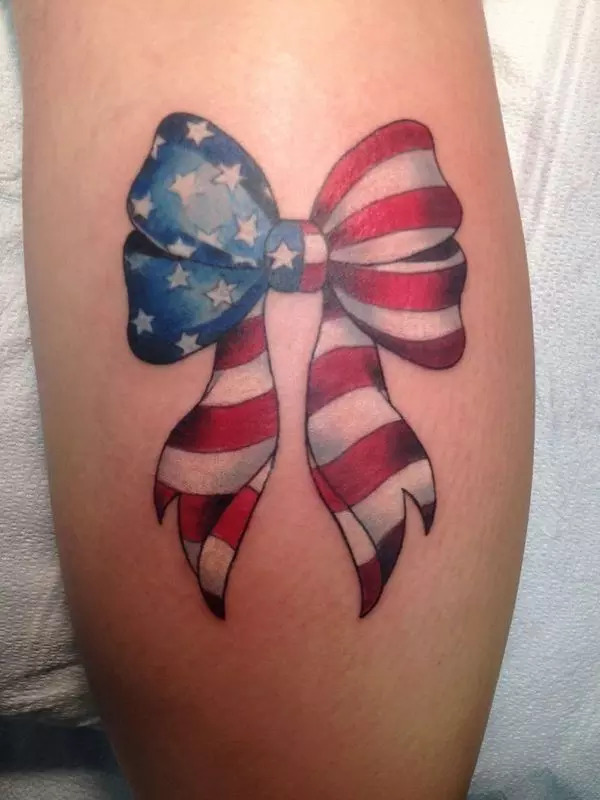 Just because you want a plain depiction of a flag doesn’t mean you’re stuck to just using a single one, though, mix it up by maybe using two of them crisscrossing each other to make it stand out, probably even more. 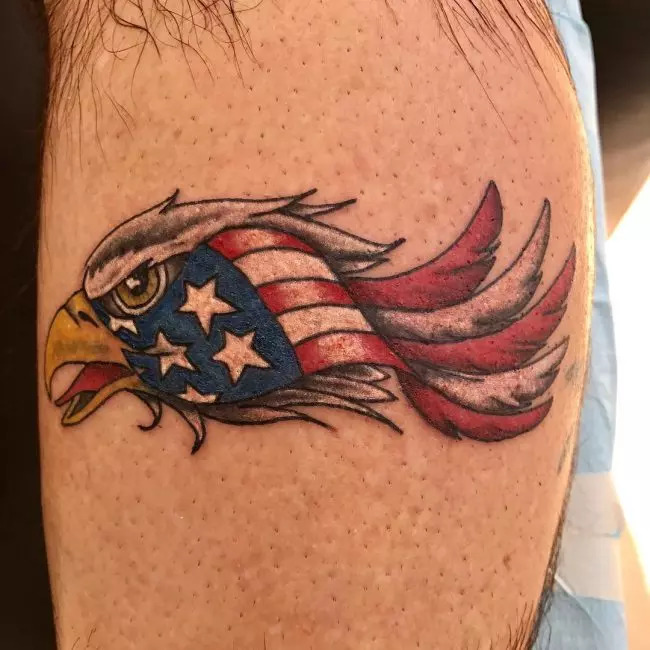 The bald eagle is a very strong bird, and when combined with the flag indicates that you stand by your country and are ready to defend it. 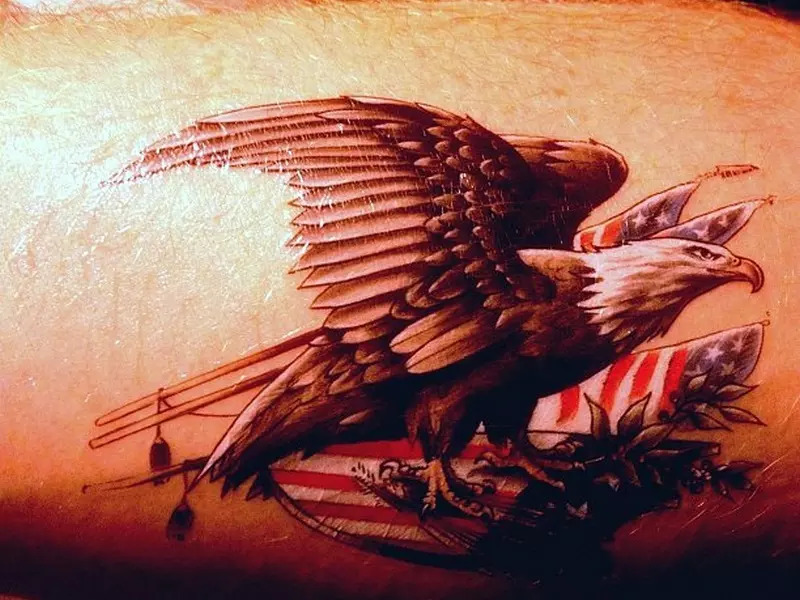 Besides being a symbol of power, the eagle really is a beautiful creature and when combined with the banner can create a very beautiful tattoo. 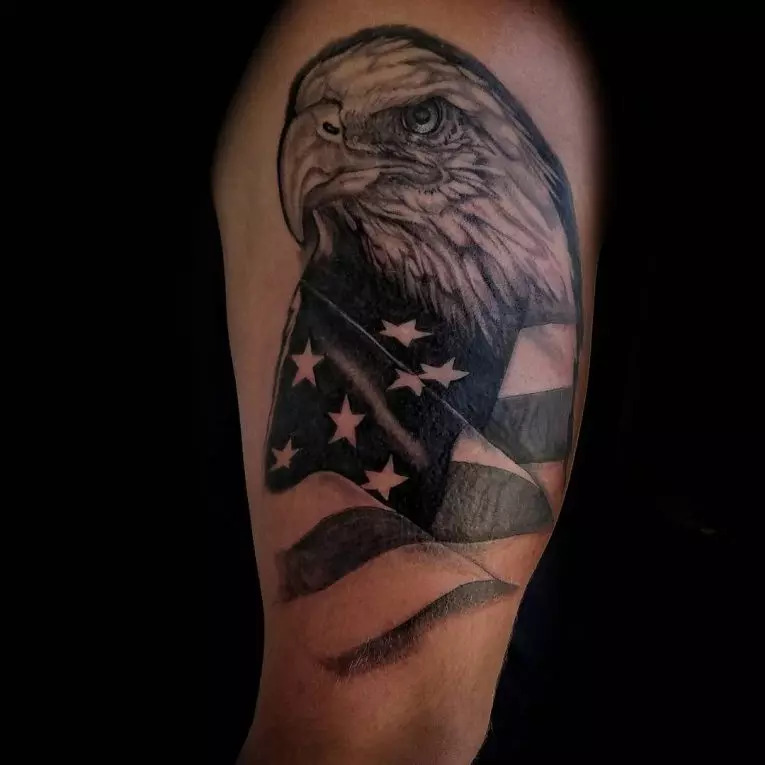 In this case, you want to have the eagle drawn with plenty of details, accentuating the eyes, talons, beak and most important, the wings. 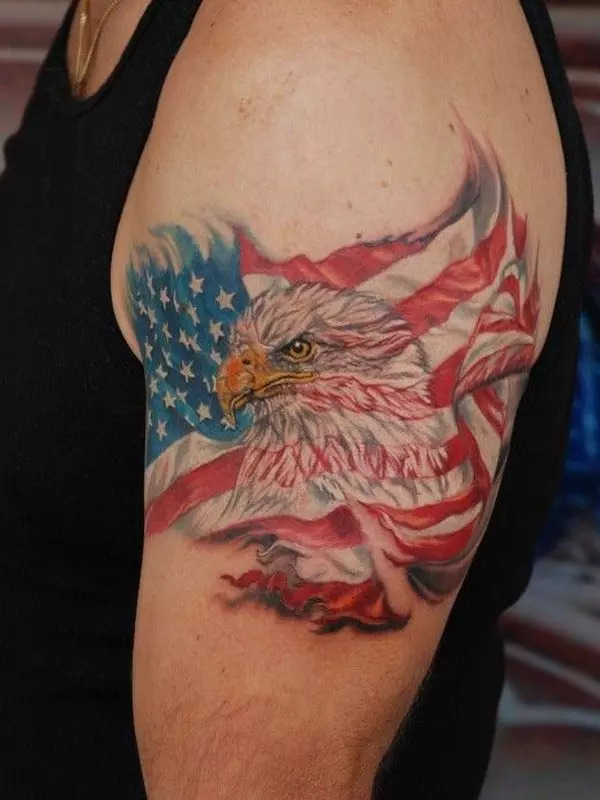 You can also choose where you want the flag to be in relation to the eagle, whether behind it, beside or covering the eagle like a cloak. 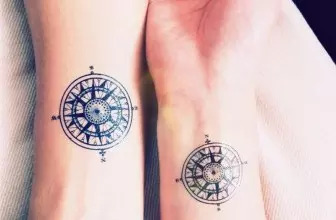 Remember there are plenty of such tattoos and you want to make yours extremely unique so play around with the ideas to find one you truly love. 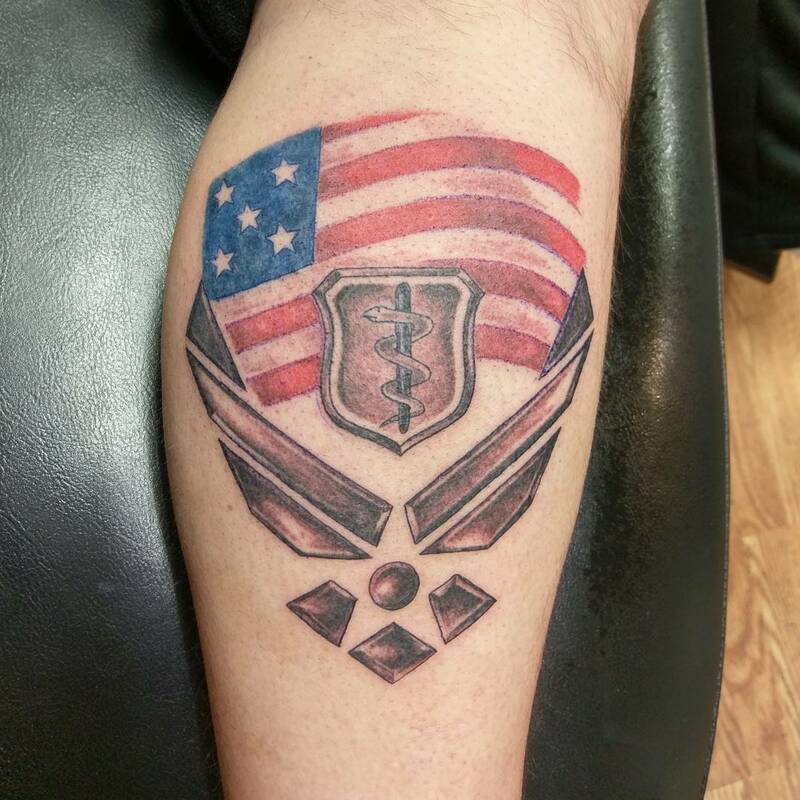 If there’s one group of people that really deserve our honor, it’s the US army. 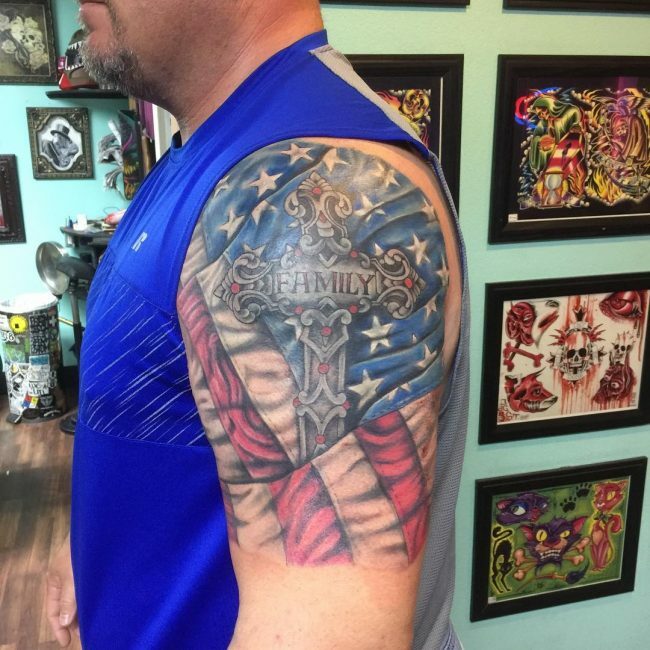 These guys, and recently women, fight for the country and defend our values. 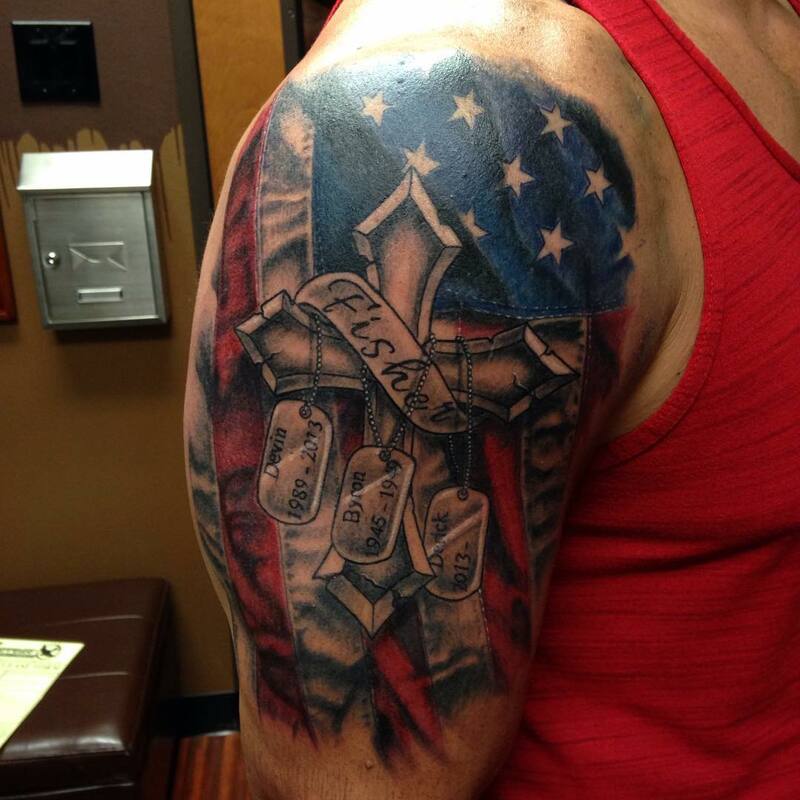 You can choose to honor the army in general or maybe someone specific you know in the army. 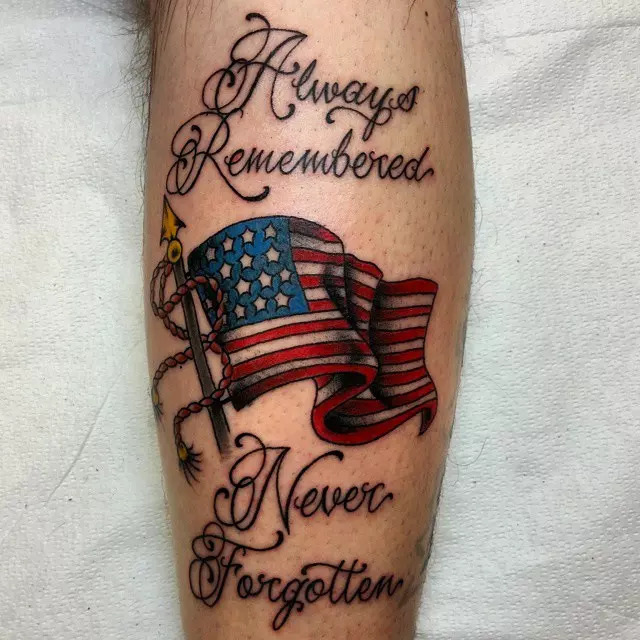 Most of these, sadly, are made in memory of a soldier who died in battle, and quite often the flag is shown folded to communicate as much. 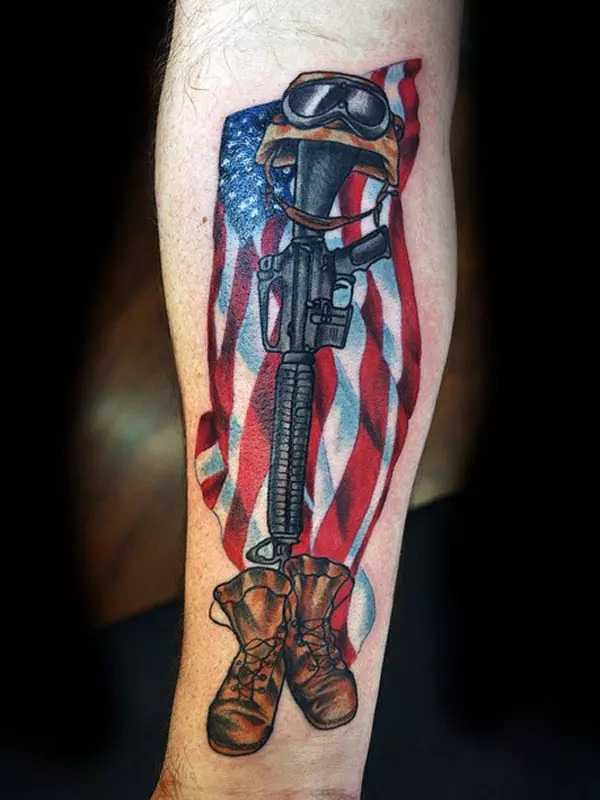 Again, there are different variations to this one too, like one with a gun and helmet and the flag in the background, or a flag with an inscription of the dates of birth and death of a soldier. 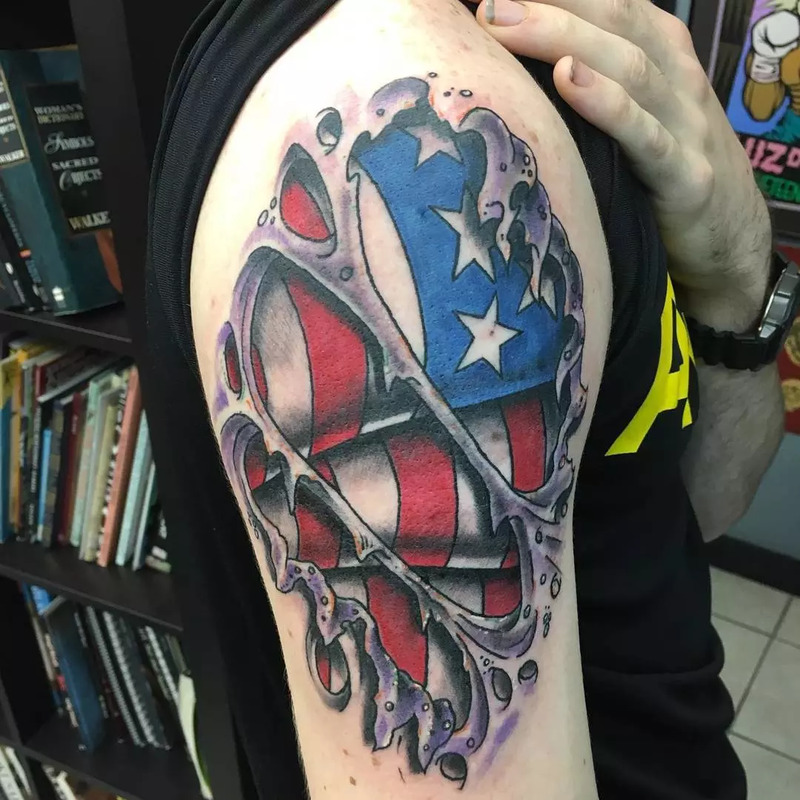 This design is extremely personal and should really illustrate your feelings. 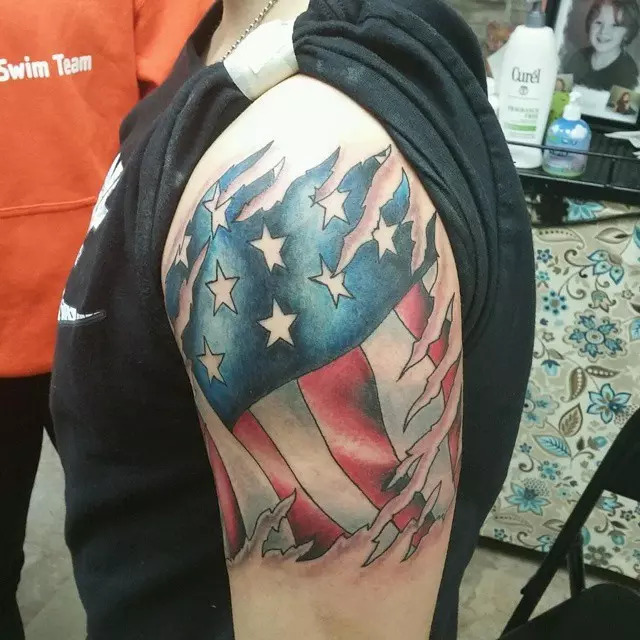 They say a picture is worth a thousand words, and you can use the illustration of the flag to accompany a message you have drawn on a tattoo. 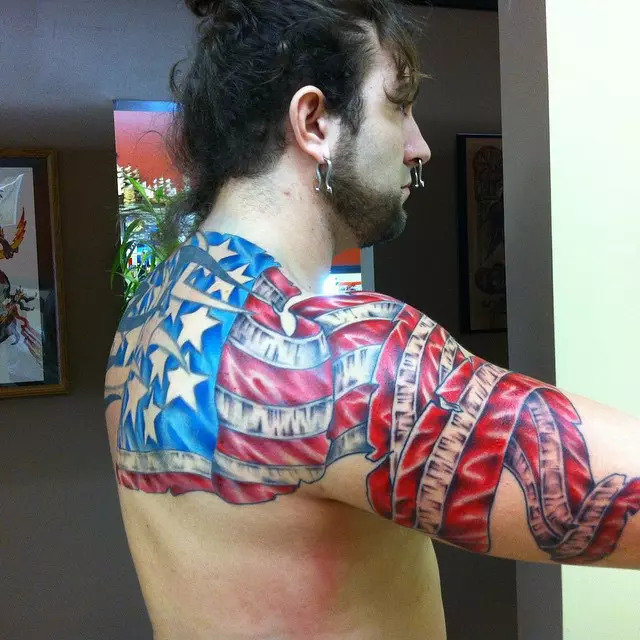 For example, you want a tattoo that says, God bless America’, nothing is better to accompany the statement than the American banner. 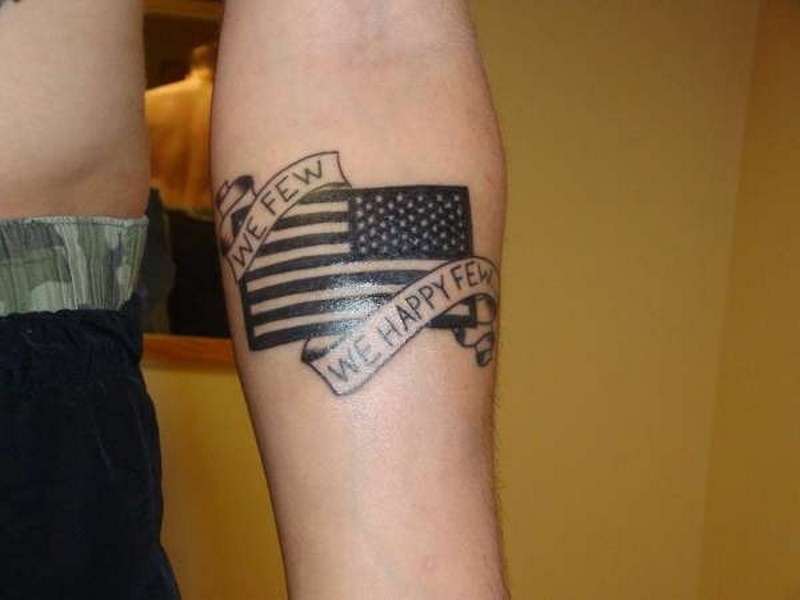 In this case, you will use the flag to enforce your message. 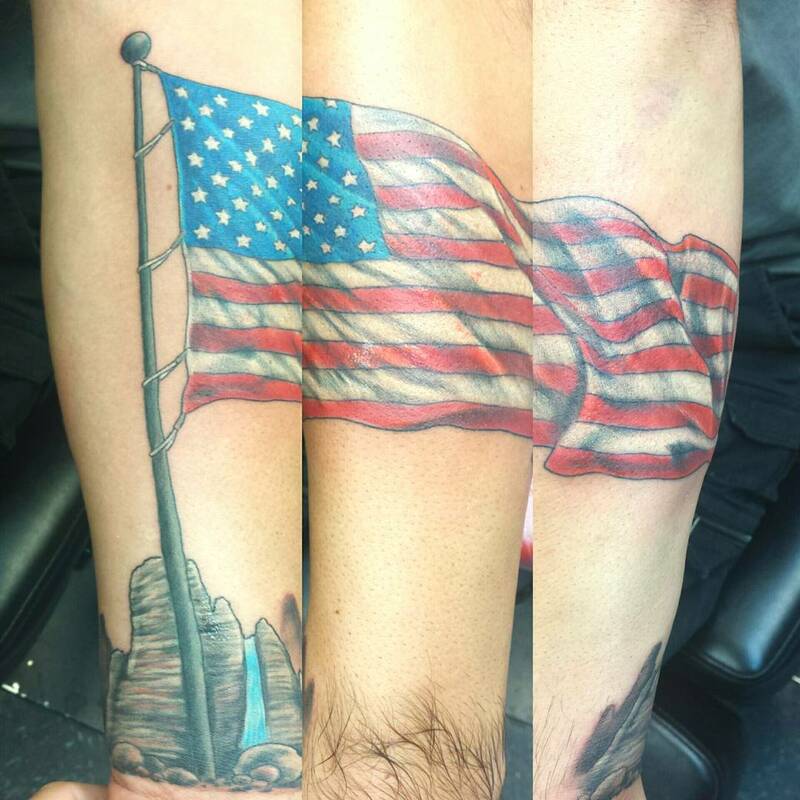 You can choose any design of the flag you wish here, provided it sends the message. 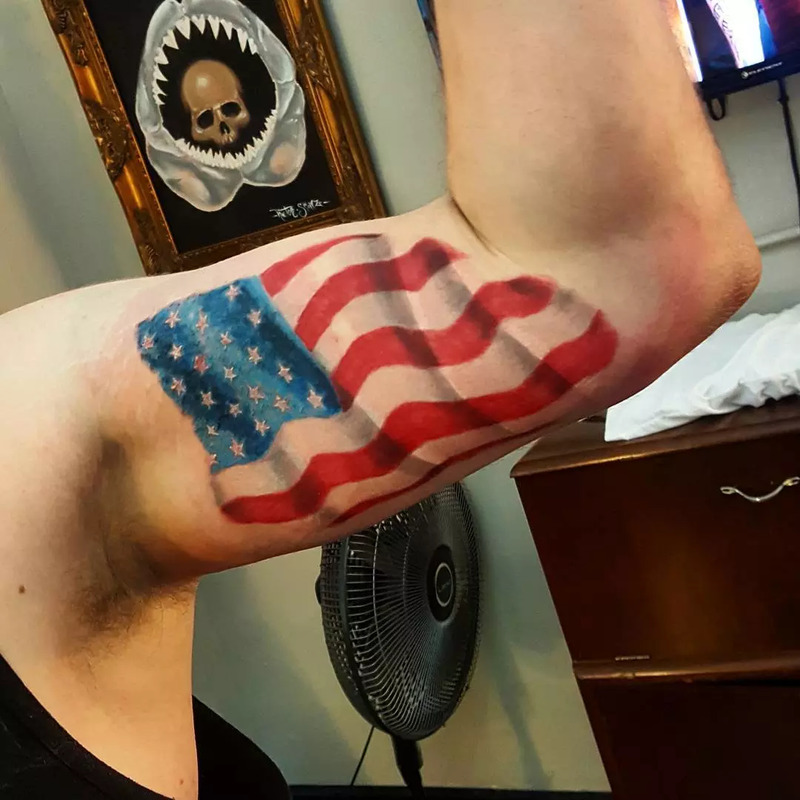 Because the flag is a symbol of national pride, it never hurts to throw in the flag onto a tattoo of a completely unrelated subject. 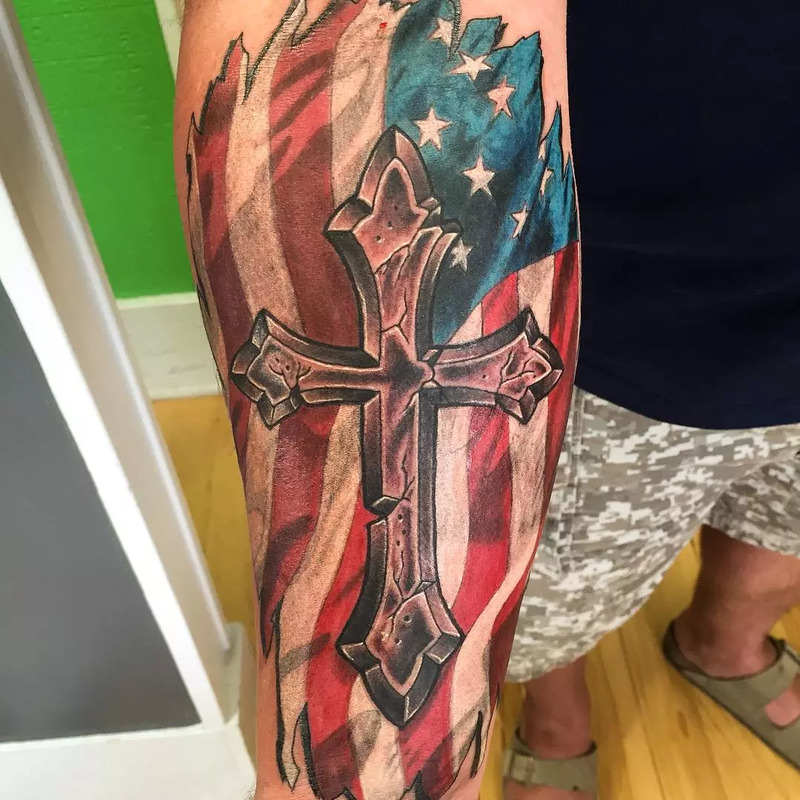 I have seen tats of Jesus on the cross with the flag hanging around the cross, which is factually incorrect, but takes nothing away either. 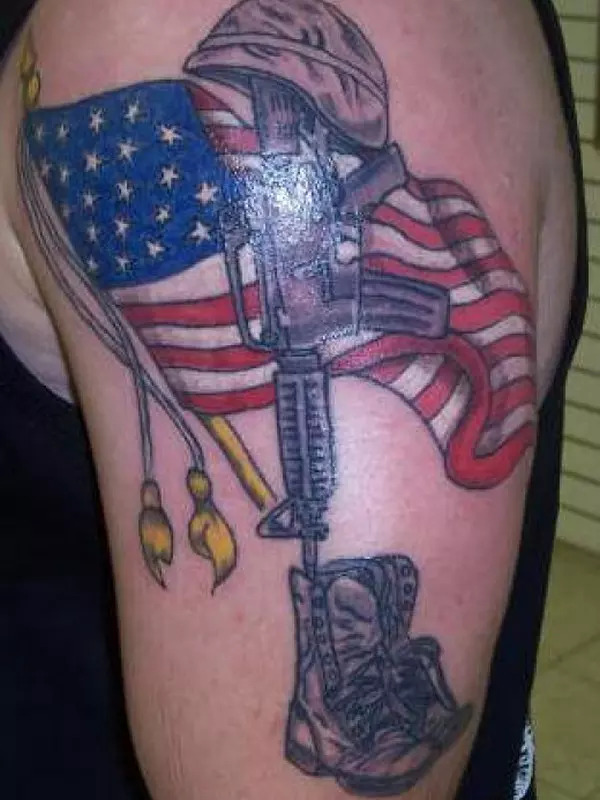 In fact, I think it adds to it. 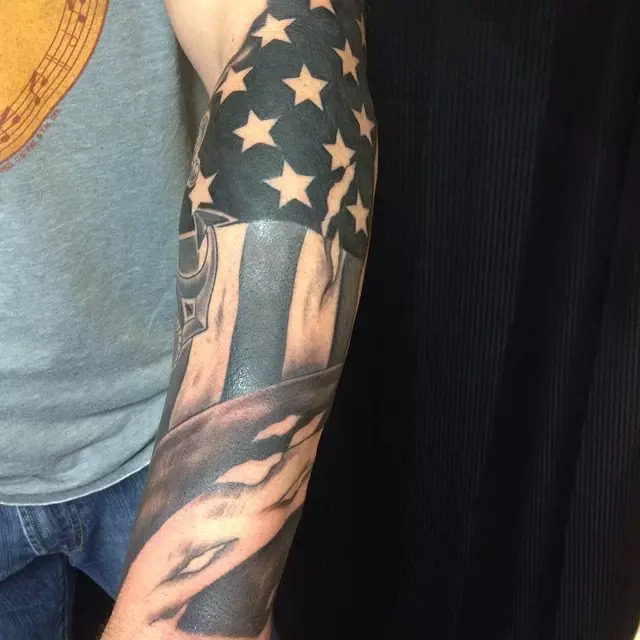 Remember that tattoos are worn for the person to display their beliefs and qualities, if you stand by the cross and the flag, then there isn’t a tattoo more fitting. 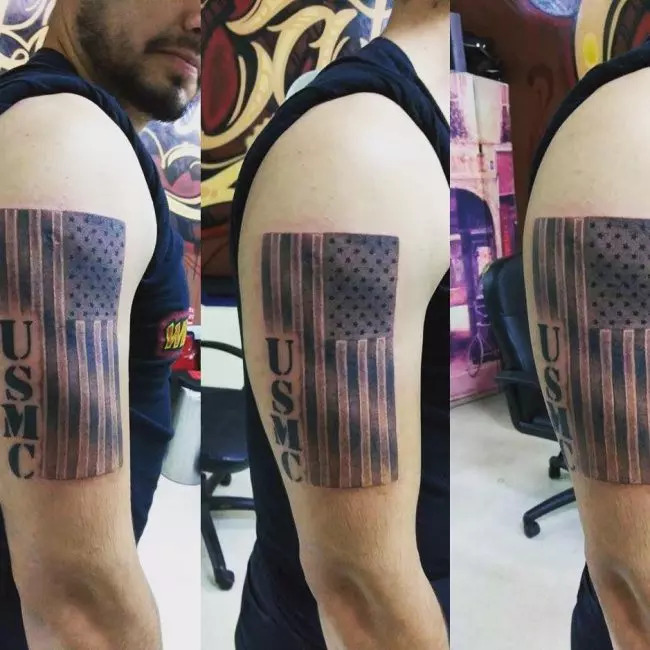 Bottom line is, as long as whatever is accompanying the flag has similar qualities, or at least in line with the flag, you can combine the two. 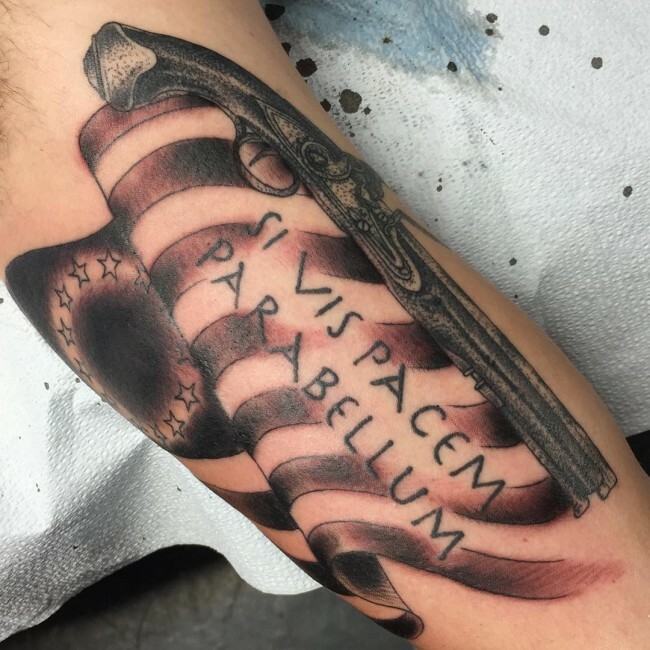 You only go wrong when there’s a contradiction between the two images.